Fun fact! 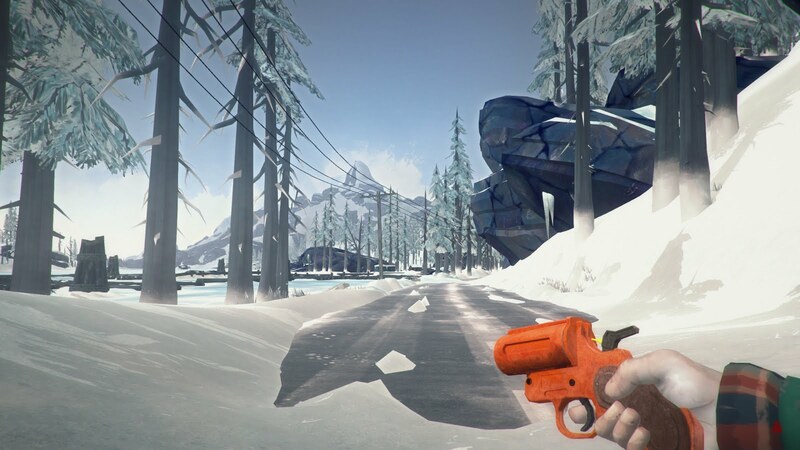 Since our last session of Peril on the Purple Planet back in October, I've dumped 54 hours into The Long Dark by Hinterland Studios. Needless to say, after all these weeks of scrounging for beef jerky, crafting boots out of harvested deer, and battling wolves, my survival game kung fu is strong! 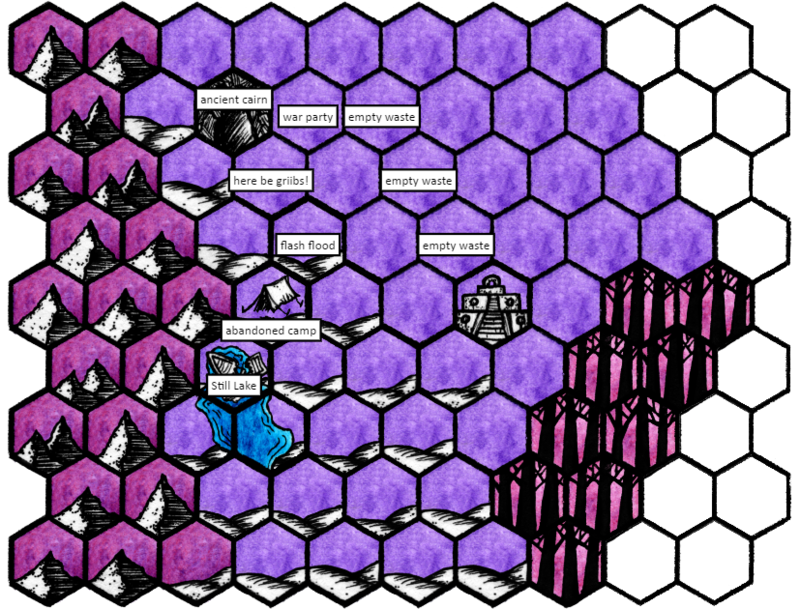 So for last night's hex-crawl, I really tried to inject a bit more of that feel into the game, especially when it came with dealing with a lack of resources and needing to live off the land. Just for the record, I came up with that quote, not Marc. But you get the idea guys. 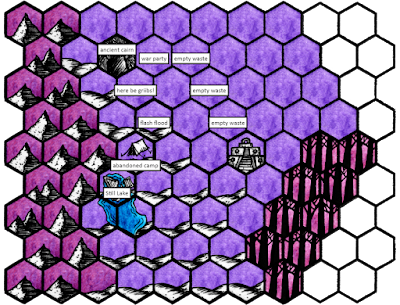 Oh, and check out this sweet map that Marc is contributing to the game! Since this was the session where the party doubled back towards the lake in the south, you can really visualize THE FREE COMPANY walking in circles! Running low on food and water the party tries searching the cairn for a source of water. Floyd Pink finds the lowest point in the room, and attempts to pry up one of the stones in the wall. Slipping while lifting the stone, however, Floyd Pink's arm gets pinned and crushed in the wall. See 127 Hours for how I was hoping this scene would go. Fortunately, water started pouring out of the tiny gap between Floyd's crushed arm and the ground. While the party's warrior writhed, begged, screamed, and threatened to shoot Nicodemus with a silver tube, the rest of the team filled their water skins and their bellies with cool water. There's a good chance that some of Floyd's blood mixed with the water, but that just added some metallic goodness to the flavor. To free Floyd Pink, Imric casts enlarge on Hammy, who in turn lifts the stone. 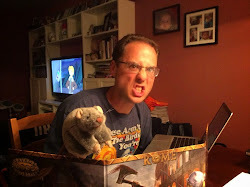 The party paladin then lays on hands and heals Floyd's smashed arm. Once it was night the party set out into the wild, again hoping to avoid the weirdling sun. They wanted to make their way to the lake to the south, hoping to find cool, sustaining water and maybe some more insight into this strange world. After a few hours they heard horrible grunts and flapping in the hills to the west. The shadowy shapes of nine lizard creatures flying in the night startled The Free Company, causing them to draw their weapons. These beasts, called Gribbs, set upon the travelers with razor sharp talons. During the battle with the gribbs, Floyd Pink almost killed himself by fumbling with his ray rifle. He was pointing it backwards when aiming the six foot long silver tube, and shot himself in the chest. Fortunately the armor took the blow, and he didn't disintegrate himself. The gribbs successfully slashed at Floyd and Imric while getting peppered by the party's ranged weapons and spells. Imric was especially angry at the beasties, and his flaming hands spell cooked three of them in flight. Once half of the monsters had been defeated, the remaining ones flew off. The party harvested the carcasses of the dead gribbs for gear. The Free Company reached the hills that surrounded the lake a few hours before dawn, but just as they began their uphill march a fierce rain poured down from the sky above. The water created a deluge that poured through the ravines and down the hills, and the resulting flood threatened to sweep away the party. Floyd Pink, Imric, and Hammy managed to climb atop a rocky outcropping before being swept away, but Nicodemus was not so lucky. The thief started to drown, and nearly died [taking 8 points of Stamina damage] before his luck turned and he was able to grab hold of some terrain. It took eight hours for the waters to recede, forcing the party to remain exposed to the weirdling sun until close to noon. Once the ground dried, the team climbed down and made their way further into the hills. Desperate to find shelter, the party searched the area for any sign of a civilization, cave, or perhaps another cairn. What they ended up finding was an abandoned camp. The small camp provided the party with the materials to make rustic hide tents, and five reed containers filled with some kind of fluid. There was also a bit of jerky to add to rations. The party rested for a full twenty-four hours before heading back out. Once night came on Day 4, The Free Company traveled a mile south until they reached the shore of the long sought after lake. Unfortunately, the water was highly corrosive. Wooden poles and rods placed in the water started to come apart. At the edge of the water, there was a bit of treasure: a dead kith laying next to a cache of greenstone shards! The party collected the shards, and then noticed even more treasure: a metallic skiff just below the water about 40' from shore. While the team tried to decide what to do next, two forms emerged from the hills to the west. It was StarRider and Saynen, who had both disappeared back in the Lair of the Mist Men! Somehow they had made it to the Purple Planet, and were still alive. Gribb Gear: In the true spirit of The Long Dark I allowed the players to harvest the dead gribbs for materials that they could use in their adventures. Each gribb had 10 lbs of edible meat, and 2 razor sharp talons that could be turned into point for arrows, bolts, javelins, and darts. If used as such, the talon-tipped weapons cause +1D of additional damage. In addition, Marc thought up the brilliant idea of converting the gribb stomachs and wing leathers to water skins. "So, Nicodemus is looking at Hammy like a big pile of bacon right now." - Alex getting into scavenger mode. "So, Marc... have you ever seen the movie 127 Hours?" - Judge James revealing the next scene to the party. "If enlargement lasts for more than four hours, contact your doctor." - Marc commenting on a popular wizard spell. "Oh wise and bright one, lead us." - Nicodemus declares his fealty to Floyd Pink... wait, what? So close to taking Floyd Pink's arm. Jadwal Taruhan Sabung Ayam SV388 12 Februari 2019 - Selasa, 12 Februari 2019 – Pada Hari Tersebut Akan Di Laksanakan Berbagai Pertandingan Sabung Ayam Secara Live di Arena Sabung Ayam Thailand.